The “Alpine Winter Conference on Medicinal and Synthetic Chemistry” exposes attending scientists to cutting edge synthetic and medicinal chemistry as well as latest developments in technologies that foster innovation in drug discovery. The main target audience for this highly interdisciplinary meeting will include medicinal and synthetic chemists, as well as related drug discovery disciplines from both industry and academia as well as graduate/undergraduate students and postdocs. In the spirit of Keystone and Gordon conferences as well as the MBCF (Medicinal and Bioorganic Chemistry Foundation) conference in Steamboat Springs, the format of this meeting provides ample opportunity for attendees to informally interact. The aim is to strengthen existing networks and create new contacts. For each of the below topics, a slot in the programme will be available for an oral communication selected out of the submitted abstracts. In addition, an open MedChem session on "Drug Discovery Tales" will have 3 open slots for oral communications. See instructions on "How to submit your abstract online". The official symposium language is English. 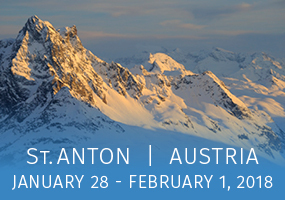 We are looking forward to welcoming you in beautiful St. Anton!